American Farm Bureau Federation volunteers scoured stores in 39 states to record prices for traditional Thanksgiving fixings. The survey found that for a party of 10, an average dinner runs $49.12 — 75 cents less than last year. The primary reason? Turkeys. Lots of them. The commercial turkey flock has recovered from the massive bird flu outbreak to the point that the U.S. Department of Agriculture predicts farmers will produce more than 6 billion pounds of turkey this year. That’s 10 million more than 2016. In turn, wholesale turkey prices are just under a dollar per pound for the first time since 2013, according to John Newton, the federation’s market intelligence director. Shoppers will be charged an average of $1.40 per pound. Frozen turkeys are up 22 percent compared to last year, Newton says, which has contributed to the turkey glut. It’s not just cheaper meat, though. Milk, sweet potatoes and rolls are cheaper this year compared to last. 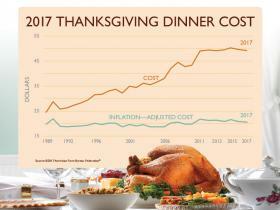 But dessert will cost a little extra, as whipping cream and pumpkin pie mix are up eight cents from last year. Looking forward, Newton anticipates 2018 Thanksgiving prices will be similar to this year unless there are livestock diseases or weather issues.